While walking along the road finishing up the Estuary Life Trail loop at Starrigavan back in January, I was a little surprised to see a pair of Black Scoters in with a small group of Surf Scoters. 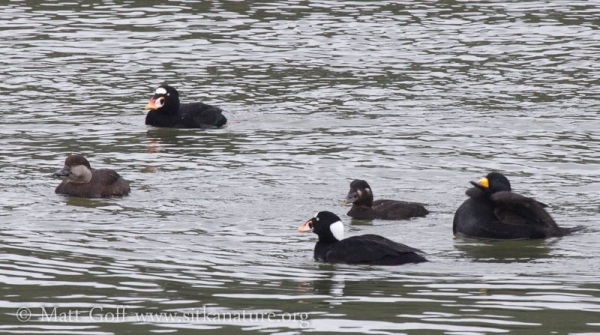 My impression is that most winters only a few Black Scoters winter in the area, and only occasionally are they spotted from the road (unlike White-winged Scoters and Surf Scoters, both of which can be easily seen from the road in winter). Even better, they came up near the mouth of Ghájaa Héen (Starrigavan Creek). I couldn’t help but stop and try to get some pictures. I was grateful for the opportunity to get the chance to observe and photograph these birds. While I’m on the subject, for some time I had been uncertain how easy it was to tell female Black and Surf Scoters apart. The males are pretty obvious (see picture below), but the females have less striking differences. What stands out to me the most (now that I’ve had a chance to observe female Black Scoters a couple of times) is the contrast between the dark upper and light lower split about in the middle of her face. 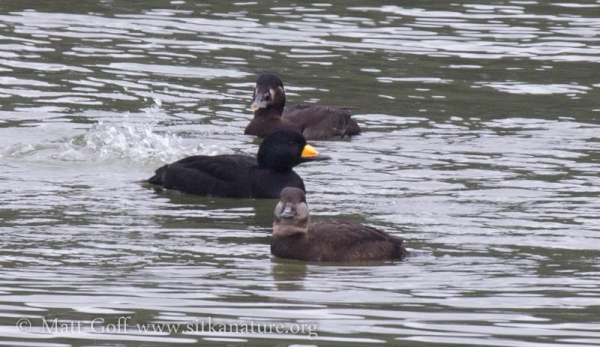 On the female Surf Scoter, the lighter coloration is restricted to a couple of spots/patches. This entry was posted in birds and tagged Black Scoter, Starrigavan, Surf Scoter. Bookmark the permalink.